There are a lot of things that can affect the performance of your garage door. Seeing as the opener is perhaps the most important part of any automatic system, any problem regarding this device will compromise the performance of the door and the security of your home. A lot of issues can stem from an improper installation, so it's important that if you have a new unit installed, you make sure that professionals are the ones who set it up. Our skilled technicians will make sure your opener is correctly connected to the door and the ceiling of your garage. If your current unit seems to experience any issues, you can count on us to solve them. To ensure your door performs exactly the way you want it to, you need to choose an opener model that is a perfect fit for your needs. There are a number of factors you will need to research to do this. First is the type and size of your actual door. The horsepower your garage door opener will need to generate will be determined by how heavy the panels are. Another factor to think about is the drive system that you prefer. You may want to go with a silent belt drive opener, or a cheaper and stronger chain drive unit, for example. Then there are special features that are worth your consideration. Some of the different features that you'll want to consider include things like rolling code technology which prevents thieves from opening your door with a different remote, or WiFi connectivity, which will make it possible for you to use your smartphone to operate your garage door. There is a lot of information to process when choosing the right opener model and our technicians have the knowledge to help you make the right choice for you. We work with major brands like LiftMaster, Genie and Craftsman, so any model we offer you is bound to be of the highest quality available on today's market. 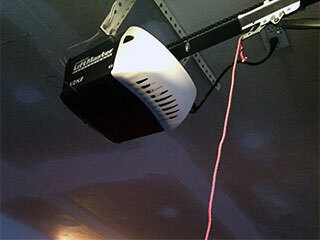 There are a few different things that can affect the performance of your garage door opener. A broken motor gear, for example, or issues with the circuit board can be common, especially if the device doesn’t undergo regular maintenance. The photoelectric safety sensors will also need to be checked and tested periodically to ensure that they are working correctly and that their alignment is precise. Our technicians at Garage Door Repair Trumbull are happy to be of service and help you select a new model or perform any opener repair related task that you may require. Contact us today.